When you are newly diagnosed with Cholesteatoma it can be a worrying and c onfusing time. 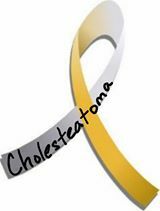 If, like me, you had never even heard of the disease, you will be trying to find out as much information as possible about cholesteatoma. This website has been set up to help those newly diagnosed and those living with the condition in the UK, however the information and advice will be relevant to you wherever you are in the world. The purpose of the International Cholesteatoma Association is to provide support, share knowledge and campaign for improved services for people with a diagnosis of cholesteatoma. Cholesteatoma is a relatively rare disease. In the UK there may be around 3,000 adults and 1,000 children with cholesteatoma. The exact prevalence is unknown, although the Association is planning to collect data to give more accurate information. The good news is that it is possible to find other people who have direct experience of cholesteatoma, and one of the aims of his website is to connect you to these patient experts. We have links on the support page to relevant organisations. There is also a link on the support page to a very active facebook group that will be invaluable to you. We will also be setting up an e-mail helpline run by a network of volunteer Regional Support Co-ordinators. Finding medical information and advice about cholesteatoma is quite hard. The information sheet ‘What is Cholesteatoma? is a good starting point and will direct you to the websites we have found that have detailed information on cholesteatoma. Consultant advice on treatment options and postoperative advice can vary, however the majority of cases will require surgery. There is useful information on questions you may wish to ask your surgeon to enable you to make a decision about surgery. The worry and anxiety around your diagnosis is something that is real part of the condition. We have created an information sheet for this exact purpose ‘Creating emotional resilience’, It is important to look after your health and wellbeing so that your cholesteatoma diagnosis does not define you. We hope that you find the advice on managing anxiety helpful and practical, and that it makes a difference to the way you feel.